Equipo Nizkor - Coalition Contributions to Countering the Islamic State. exposing IS's true nature (led by the United Arab Emirates, the United Kingdom, and the United States). Coalition participation tends to be fluid, with each country contributing capabilities that are commensurate with their own national interests and comparative advantage. Since August 2015, several coalition participants have changed the roles, missions, and capabilities of the military forces they are applying to counter the Islamic State. Russia also initiated military operations in Syria, but it did not begin robustly targeting Islamic State forces until Russian authorities concluded in mid-November that a bomb had brought down a Russian airliner in Egypt in October 2015. Indeed, Russia's military operations in Syria to support the Asad regime appear to be independent of the global counter-IS coalition's activities. France has conducted military operations alongside the United States to counter the Islamic State for over a year. From February 23 to April 18, 2015, it deployed the aircraft carrier Charles de Gaulle to the U.S. 5th Fleet's area of operations, from which French Super Etendard and Rafale fighter aircraft conducted airstrikes in Iraq. |21| It also used fighter aircraft forward deployed in the U.A.E. and Jordan to conduct strikes. |22| However, during this period, France limited its operations to Iraq, citing two primary constraints: the lack of a formal international legal mandate to pursue operations in Syria, and a desire not to inadvertently support the Asad regime. On July 31, 2015, at the request of the Iraqi government, NATO agreed to launch a military assistance program for Iraq, which will be based out of Jordan and Turkey, and "includes measures of support in seven priority areas: advice on security sector reform; countering improvised explosive devices, explosive ordnance disposal and de-mining; civil military planning; cyber defense; military medicine and medical assistance; military training; and civil emergency planning." |42| Teams are presently being sent to assess Iraqi needs. |43| NATO also deployed six Patriot missile defense systems to Turkey, |44| although they are scheduled to be withdrawn in December of this year unless NATO authorizes their continued presence. Organizing and prosecuting a coalition campaign presents a variety of challenges in addition to the military task of defeating an opponent. In the first instance, without a single authority responsible for prioritizing and adjudicating between different multinational civilian and military lines of effort, different actors often work at cross-purposes without intending to do so. These coalition coordination challenges were demonstrated in recent military campaigns (particularly in Afghanistan). Exacerbating matters, other actors in the region—some of whom are coalition partners—have different, and often conflicting, longer-term regional geopolitical interests from those of the United States or other coalition members. This, in turn, may lead nations participating in the coalition to advance their goals and objectives in ways that might contradict each other. Finally, different participants in the coalition have different tolerances for risk, and therefore will determine "rules of engagement" (ROE), or "caveats" that can constrain the ability of military commanders from employing military force as they see fit. While navigable, all these factors can make it considerably more difficult to consolidate gains and achieve campaign success. This brief report offers two figures. The first is a chart depicting participants in the military campaign, and what specifically each country is contributing in terms of military forces, according to open source data compiled by CRS and information provided by United States Central Command at the time of writing. 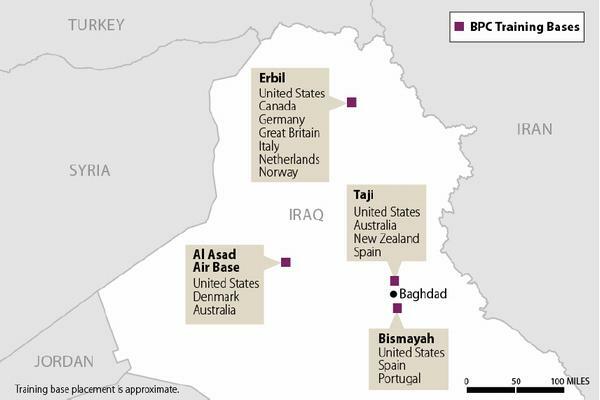 The second maps the training and capacity building bases across Iraq, and key nations operating out of those bases as reported by United States Central Command and supplemented with open source reporting. This report update reflects significant changes regarding the coalition's composition since August 3, 2015. Canada 69 N/A Announced withdrawal of 6 CF-18 Hornet fighter jets, although timing unclear. Also unclear whether! CC 150 Polaris Air Transport, 2 CP-140 Aurora surveillance aircraft will remain in theater. France 200 N/A 6 Dassault Rafale M multi role fighters, 6 Mirage 2000D aircraft, 1 Ravitailement C135 aircraft, 1 Atlantic 2 Maritime Patrol aircraft, 1 cassard-class air defense frigate. Charles DeGaulle aircraft carrier includes 26 additional fighter aircraft (pending arrival). Sources: United States Central Command data, augmented by data gathered through open source reports. Notes: Country contributions are approximate due to rotations in and out of theater. These numbers are subject to rapid change based on changing circumstances. � Australia recently announced that it would send 330 extra troops on a two year mission to train Iraqi soldiers, with about 200 soldiers in Iraq prior to that announcement. b. Belgium's contribution to the airstrikes against ISIL ended June 30, 2015, due to financial constraints. Six Belgian F-16 fighters spent nine months in Jordan. c. France began conducting ground-based airstrikes against Syrian targets in September 2015. France's capacity to conduct airstrikes will increase when the Charles de Gaulle aircraft carrier arrives in theater. d. On July 17 2015, the Ministry of Defense confirmed that British pilots had taken part in military strikes in Syria, despite the fact that Parliament voted two years ago against military action there. e. These Carabineri troops perform police training tasks. f. Up to 20 F-16 aircraft participated in airstrikes against ISIL in response to the killing of a Jordanian pilot. It is unclear if this many F-16's participate in regular airstrikes against ISIL. g. It is unclear if all of these aircraft are for combat sorties against ISIL or if they are force protection for Dutch ground forces. h. The Swedish Parliament approved 35 troops to be sent to Iraq, but have stated that they are willing to raise that number to 120.
i. Based on a recent agreement struck between the United States and Turkey on July 23, 2015.
j. The number of F-16's is based off of press photos of the UAE squadron deployed in Jordan. k. The United States has pledged 400 to 700 troops to train Syrian forces. It is unclear how many forces are currently in place. l. Based off of the data in this chart; not including the unspecified number of troops contributed by NATO. m. Seven Danish F16 aircraft were redeployed to Denmark for refitting and refurbishment in late August 2015. It is unclear whether, and when, they will be sent back to theater. Denmark also contributes a C-130J. n. According to press reports, Canada will be increasing its troop levels for the training mission. Source: United States Central Command and Open Source Reporting.